Readers for Teens provide engaging fictional stories with important themes for young learners of American English. 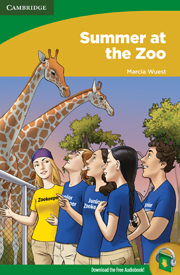 One summer, Sofia, her brother, and two friends work as Junior Zookeepers at the local zoo. They all learn a lot about the animals and the zoo. For her final project as a Junior Zookeeper, Sofia helps with the Zoo Parents Program. It's a great success! This reader is about 1900 words long.